ASTM A320 is a fastener specification covering bolts intended for low-temperature service. Applications for these fasteners typically include pressure vessels, valves, flanges, and fittings. The most common configurations of A320 bolts are fully threaded studs and heavy hex bolts, although other products including rods with threads on each and various bent bolts can be manufactured. Within the A320 specification are several grades manufactured from both stainless steel and alloy steel. Some of these grades undergo a Charpy impact test to determine a material’s toughness at low temperatures. Salesperson Jim Truong and Web Designer Sarah Kemp have teamed up to create a website that is designed to educate engineers, architects, contractors, fabricators, original equipment manufacturers, and other construction-related companies about all facets of the A320 specification. This site includes common grades within the A320 specification, configurations, various applications, manufacturing and galvanizing operations, frequently asked questions, and compatible nuts and washers. We encourage you to contact Jim or one of our other salespeople with questions, for a price quote, or to purchase A320 fasteners. Our Bolt Torque Chart continues to be one of the most popular pages on the Portland Bolt website. 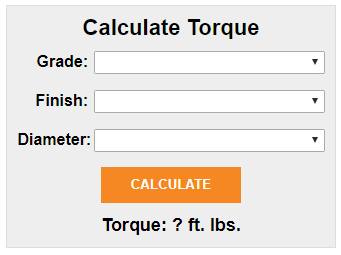 We recently supplemented this page with a calculator tool that will prevent you from searching through the numerous tables for the correct torque. Instead, simply enter your bolt grade, finish, and diameter into our handy tool and voila…..your suggested starting torque value is calculated! FAQ: What is a CMTR? The acronym CMTR stands for “Certified Mill Test Report” or “Certified Material Test Report.” A CMTR, typically provided by the raw material producer (mill), is a document assuring quality and providing evidence of the chemistry and mechanical properties of the steel. Hū Honua Bioenergy is one of the keys to Hawaii’s energy independence. The plant will produce 30 megawatts of power fueled by homegrown biomass. Biomass is a plant or plant-based material used to generate electricity. In late 2017 and early 2018, this project required over 27,000 pounds of structural bolts and anchor rods in a short time span. Our west coast location makes us an ideal supplier for projects in Hawaii.